Since 1947, Salomon has been based in the French Alps. They started out with a wood saws and ski edges’ workshop in downtown Annecy and by 1957, progressed onto revolutionising ski bindings. They ditched the traditional leather binding straps for a cable binding and developed an automatic machine for making steel edges. Over the next 10 years, Salomon invented the Allais safety binding and the first binding with a self-release heelpiece. 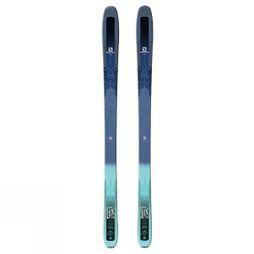 By this point, they had worldwide distribution networks and the brand was becoming known as the world’s best binding maker, appearing at the Olympic Games in Portillo, Chile. The first Salomon Alpine boot was launched in 1979 and the company continued to expand on their collection including moving onto Skis in 1990. For their uncompromising dedication to manufacturing the best ski equipment and clothing, Snow+Rock have a vast range for winter 16/17. Winter 16/17 shows technological developments both within Salomon’s clothing and equipment. Equipment has become stronger and lighter whilst clothing has great fit. They’ve listened to consumers to understand what would improve usability in their product and developed technology to make these changes a reality. This is why Snow+Rock stocks a head to toe range. The icon 2 custom air helmet is the latest version of the model. It’s lightweight due to the new flyweight shell and this is bonded to a high-performance EPS 4D technology liner. 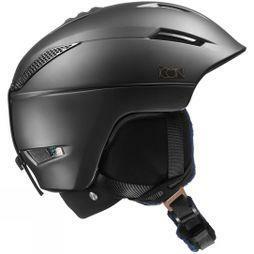 The EPS 4D technology within the liner acts as a shock absorber, to protect the wearers head more efficiently. Ear pads are washable and removable, along with the liner. The custom air has a slightly different fine tuning adjustment system. The point is to keep the helmet comfortable and secure by manually pumping up or releasing the air as desired – a robust and effective system! Goggles improve with every season that passes so it’s no surprise that the Sense goggle has revolutionary fit and vision. It’s the multilayer lens technology which gives the goggle its iridium appearance but also a wider range in varying light conditions, sharper vision and glare reduction. A skiers’ blind spot is different from snowboarders due to the body position when travelling down the mountain. This needs to be taken into account when on the mountain but the broad field of vision with a wide lens design in combination with a narrow frame will assist and Salomon has mastered this in the Sense goggle. Extra attention has been payed to detail on the Icerocket jacket. AdvancedSkin Dry 4-way stretch fabric allows for unrestricted movement, essential for adjusting ski boots in between runs and the MotionFit technology works alongside this so the jacket stays in place. Waterproof and breathability ratings can be confusing but rest easy knowing that the 20k/20k weather protection will ensure that the jacket can easily sustain a hard day of riding in wet conditions even with the added pressure of wind, sitting down and falling over. Style and comfort makes these snow pants a must have. The insulation and taped seams will keep you warm and dry all day but the stretch offers a flattering feminine silhouette and allows for easy movement. To top it all off, they’re bright, bold and come in five different colours! This is an advanced to expert level boot, jam packed with features and a lot of adjustment. The boot has a flex level rating of 100. To break that down, a less powerful skier will want a softer boot to properly flex when initiating turns whilst a more experienced skier is likely to prefer a stiffer boot to support them. The X Max 100 is exactly this but popular as an upgrade as it is gentle on the foot with the help of Twinframe technology. Twinframe Technology is essentially the use of high density plastic used on the frame of the boot which extends to the upper shell and then a more accommodating softer plastic is used on the instep. Finally, the liner and shell of the boot are both fully customisable with heat moulding to solve any hotspots for the skier. The QST series is designed to be versatile and offer great performance in every condition. The Lux 92 is a lightweight, all-mountain ski for intermediate to advanced skiers. Key features across all models makes the QST range unique. For example, the all-terrain rocker 2.0 is used in skis for all abilities. The QST Lux 92 has full camber underfoot which provides power, energy and more effective edge-hold in firmer conditions but the slight rise on the tip and tail allows the ski to float on soft snow. Ideal for varying snow conditions on and off-piste! All models of the series have a full wood core, a layer of titanium and a CFX fibre woven layer ensuring a damp and stable feel without the added weight. All in all, the QST range are an incredible ride. If you don’t believe us, test them out for free at Hemel Hempstead Ski Centre. Ask in store for details. Win a Week’s All Terrain Training Course! Enter now for your chance to win a fantastic weeks’ All Terrain ski training course with the team at Snoworks. The prize for two people (must be level 3 blue run skiers) includes flights from London, transfers, lift pass and accommodation at the Chalet Hotel L’Ecrin in Tignes, including breakfast, afternoon tea and dinner with wine. Also included in the prize is skis, boots and bindings from the team at Salomon, to be professionally fitted at your local Snow+Rock store. Engineered to perform in some of the most severe, bleak but beautiful climates in the world where you could encounter all four seasons in one day, turn to Norrøna. It’s this ability to protect that has seen Norrøna maintain a reputation for trusted quality for over 85 years.